As per the new pay commission announced last year, the central govt. had made some modifications in the salary slabs of the employees working under the central govt. and the central govt. undertaking public bodies. In this case, the salary slabs of the associate professors working in the central govt. colleges and universities will also get modified. The new pay scale is the 7th pay scale and will be implemented from 1st Jan, 2016. 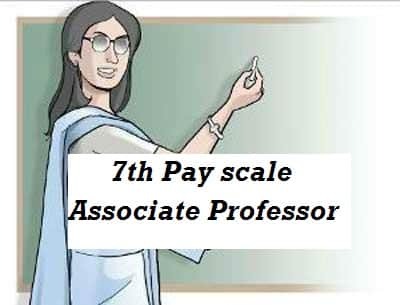 So the rank of Associate Professor will also enjoy salary hike as per the guidelines of the 7th pay commission. The new pay commission is the 7th pay commission. But before that, the existing pay commission was the 6th pay commission. The associate professors used to get salaries as per the salary slabs of the recommendations of the 6th pay structure. Earlier, the associate professors used to get salary under the slab – Rs. 37,400 – 67,000. In additional to this, they used to get Rs. 8,900 in form of Academic Grade Pay (AGP). But after the implementation of the 7th pay commission, the salary slabs are sure to get increased. What are the new recommendations as per the 7th Pay commission? As per the new 7th pay commission, which is supposed to come into effect from early 2016, the salary slabs of the central govt. employees, public organization employees, teachers and professors of the universities under the affiliation of the UGC will get hiked. Their basic pay structures will be modified and their grade pays will also get revised. As per the new recommendations by the 7th pay commission, the salary slab which the associate professors will enjoy will be a whooping Rs. 1,00,000 – 2,00,000 along with a grade pay of Rs. 27,000. As per new amendments of the UGC, the ranks of lecturers, senior lecturers and readers are no more. Instead, the ranks of assistant professors, associate professors and professors are created. Associate professors get their salary as per the pay scales of the central government. The new pay commission will increase the salary structures of the associate professors and also other incentives which they get. As per the 7th pay commission panel committee, there will be a hike of more than 23 % in the overall salary of the central govt. employees and employees of public bodies which are undertaken by the central govt. There will also be a hike in pension of the employees. The teachers, professors, associate professors and assistant professors will also get the salary hike and other benefits from the new pay commission.